The Siberian electoral battle is as tough as well as cold. According to the polls, the pro-government United Russia party is in the lead, however the opposition is not giving up. The poster does not elaborate on what it is exactly that is choking the Russian countryside. There are a wide range of options, including meager pay, unemployment and environmental pollution. But this kind of campaigning has provoked a storm of emotions among the people who pointed out that United Russia, after 10 years of running the country, should be asking these questions of itself. The posters were changed after these ideas were expressed on the Internet. Now United Russia’s campaign slogan reads “more state support.” Vladimir Nebalzin, who lives in Barnaul, considers this to be a way of bribing voters and has filed a complaint with the regional electoral committee. Yelena is a young woman with a good job in a modern firm. She is the kind of person the pro-business, liberal party Right Cause should appeal to, but since expelling it’s best-known member, billionaire Mikhail Prokhorov, Right Cause has again sunk into a political coma. 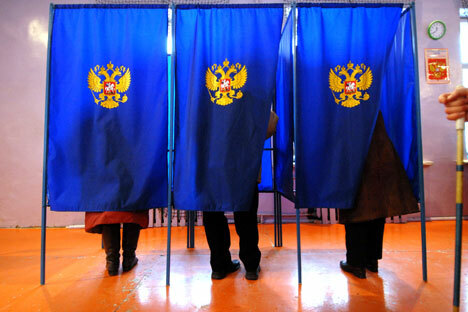 Many Siberians say they will not vote for parties whose seats in the Duma are, according to opinion polls, guaranteed. These are United Russia, the KPRF, the LDPR and Just Russia. Since the “against all candidates” box, another popular option, has been deleted from the ballots, pensioner Valentin Khanovich thought the best thing under the circumstances would be to waive his right to vote and ask the electoral commission to strike his name from the roll of voters. The electoral commission refused to do this and the trial court upheld its decision. While growing protest is not uncommon, a growing desire to give vent to such sentiments is something new,” said Sergei Andreyev, of the voter’s rights group Golos. For their part, the electoral commissions are sparing no effort or money to make the elections look proper. They have printed election ballots in Braille for the blind; in the Irkutsk Region, early voting will be organized for people living in remote places, using helicopters, snowmobiles and boats; and in Khakassia, the ballot sheets will be in two languages, Russian and Khakassian, although few people can speak, let alone read Khakassian. They are leaving nothing to chance.